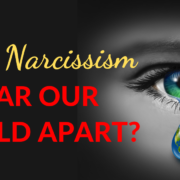 Will Narcissism Tear Our World Apart? And worse than that – we GET that world leaders, organisations and systems are infiltrated with narcissistic agendas which threaten to topple us and our world. Is this a hopeless situation? Is there anything we can do to stop this? In today’s Thriver TV episode, I am going to explain exactly WHY our planet is in the grips of narcissism, what it REALLY means, and how we CAN turn this around. If you desire to be a conscious, expanded Being doing all you can for evolution itself, I can’t wait to share this episode with you. Welcome to the Thriver’s Life series, the creation of your highest and best life after narcissistic abuse. When we start to understand what narcissism is and how much of it is in our world, even after we have significantly healed from it, it can be very confronting. We may also believe that narcissism operates at the highest levels within our communities, corporations, ministries and governments. That there are leaders, organisations and systems that are not ‘for the people’. Globally we see individuals and groups, who fulfil their personal agendas with the entitled approach of instant gratification, to produce power, prestige and wealth, without care or concern for others or the environment. How do we have items on our shelves in supermarkets that are filled with known poisons, have no nutritional value and don’t even resemble ‘food’? Why are we plagued with so much cancer and toxic overload illnesses that once upon a time never existed? How has planet earth been raped and mined to the point of depletion and desecration when there are alternatives available? How is it that we have legal and criminal systems that protect the accused and penalise victims? Why is it that grave fighting between gender, race, religion and countries, with domestic violence and warring upheaval, still exits en masse? How is it that the arms used to defend each other from getting killed or taken over from each other (I’m sure if evolved aliens were watching us, they would think that this is the most pathetic issue of all), IF laid down would free up enough money and resources to feed, house and clothe our entire planet? What’s sadder, is in our present state of consciousness, most people would believe that is a ludicrous notion! Atrocities, cruelty and barbaric acts have been a part of our world forever, and it’s tragic that these acts continue, even in so-called civilised countries where sanctions and punishments are administered for such crimes. I know many of you feel traumatised when looking at world leaders who display narcissistic traits wondering what on earth the world has come to, to allow such people in office. What is our world coming to? Are we in the grips of narcissism that could threaten to take us all down? Is it narcissism that is causing all the problems? I really do believe that it is, because it is only through malignant pathological self-absorption that the needs of the few could be prioritised at the expense of the many, as well as nil regard for the planet’s health and ecology. Are we are going to be constantly struggling with an unwell planet and sick people, the ones perpetrating the abuse, and the ones damaged by the abuse where the cracks and results are going to become more and more obvious? Or, perhaps we will see the disastrous results of a narcissist in charge whose ego runs amok, and all sensibility goes out the window, potentially triggering catastrophic events. May we go deep into the REAL truth about why humankind can act like this, and how this all became possible? I’d really like to because I think it explains a lot, everything actually. I believe this all began with programmed false beliefs regarding ‘separation’. This is how it starts: You are told that you are separate from ‘God’ and need to earn the right to be loved and approved of enough to make your way back ‘home’. As your own self, you are ‘not enough’ because you are smaller than God and carnal (essentially defective in some way). At the Quantum Level of Truth, this is a lie. You are already are connected, and a part of Source/Creation/Higher Intelligence (God) and you can never be separated, you can only live the experience of believing that you are. Why do I believe this with every cell of my Being? Because I believe the evidence is overwhelming. This Higher Intelligence (call it what we will) is always with us and responding and granting us EXACTLY what we ‘want’ meaning the inner emotional beliefs and emotions that we have on every topic on our life. This unconditionally loving force is NEVER absent, and ALWAYS unconditionally ‘gives’ to us with ZERO judgement whatsoever. If we are ‘being depressed’ then more things come from The Field for us to be depressed about. If we are ‘being committed to our self-partnering and healing’ this Force grants us the evidence and people from The Field that also starts partnering with us genuinely. And the truth is, our Life is ‘answered’ with this Force every millisecond of our life according to our Being. Why? Because this Force and us are One. Hence why this Force sees you and meets you and NEVER abandons you. That would be like this Force abandoning itself which is impossible. When you’ve had the experience of living aligned with the truth (The Source/Life/God is ever-present and connected to you) or held hostage with the lie (you are separate from Source/Life/God), the difference in your Life is like day and night. When people finally release the false separation trauma from within, they have the knowing that they are loved and approved of by Source/Creation/Higher Intelligence (God) simply because they exist. It’s then that profound Divine love rushes in, organically, as a natural state, once the false beliefs are out of the way. Far from this wisdom leading to insolence, disconnection and hubris, we start to a feel, think and act as people do when they feel loved, approved of, included, and safe in the fold of Universal Love. We become able to express our true loving nature without being shackled with shame, guilt and admonishment and requirement. When we know God/Source/Creation, and we are One, we become integrated, loving caring, wholesome human beings, and we start acting in Godly ways, with our Higher Source’s love and truth expressing through us as us. Narcissists are completely disconnected from their Oneness with a Higher Power. They believe they are on their own and need to lie, manipulate and maneuver to get their needs met or they have succumbed to the illusions of a petty, vengeful God, needing to exact wrath on others who don’t agree with this particular God’s man-made projected requirements. Narcissist’s mirror this illusion and believe that they can be their own God, and tyrannical as well. If we believe we are separated from Life/Source/God or that Life/Source/God is angry, vengeful and punishing, then we can’t feel unconditionally loved and accepted. Therefore, we are not good enough, just as we are, to love and accept ourselves either. Because the false premise of ‘separation/rejection’ is internalised between self and self, others (because we are all connected at the Quantum Level, ‘so within, so without’) start mirroring back to you your exact separation beliefs about God and yourself, and don’t appear to love and accept you either. As a result, who can you trust? Can you trust yourself? What masks and strategies do you need to adopt to try to navigate your life now? Can you just be yourself? Not the way you feel you can’t. The cracks of ‘separation’ are running through most of humankind’s lives in multiple areas. I want you to feel into this Separation Illusion that has been created. Hence the topography of separation gave rise to narcissists. It also created victims of narcissism, people who were handing over the truth of their Real Self to try to be what everyone else wanted them to be in order to be loved, accepted and safe. And there is a vital truth here, the more you are disconnected from the Oneness that really IS, the more it hurts. It’s not your natural coded state to live as. The real issue is NOT narcissism, that is the symptom. The real issue is the defunct separation consciousness that brings narcissism into being. Therefore, no calling out of narcissists, criminal punishments or political or economic reform is going to solve the issue. Only a spiritual shift in consciousness can and will. To truly heal, begins when we turn inwards to self-partner and release the internal trauma that has kept us separated from Oneness, namely Source/Life/Creation/God, and ourselves and others. And I’m not the only person advocating this with my Thriver Movement. Many spiritual teachers, as well as Quantum and Neuro Scientists, are now talking about releasing our trauma to change our consciousness. I like to think of this as, ‘letting go and letting God’, meaning allowing this higher organic consciousness of Oneness to enter us and our lives, connecting us up healthily and happily to all that we previously felt separated from. Especially our belief in, love and approval of ourselves which is vital to be able to be a healthy, whole, actualised person in life. The insane irony is that everyone, without exception, does what they do to try to feel ‘wholeness’ within, yet it was always there all along. We are now in a Golden Age of fast emerging Higher Consciousness, with spirituality and science combined on the forefront of teaching us another way to heal, from the inside out the Quantum Way. It’s so interesting, this summer there have been numerous riots on Melbourne beaches. Yet it has never happened whilst I’ve been anywhere near the beach, and I have no fear of going to the beach. I’m ‘yinging’ whilst that stuff is ‘yanging’, I’m on a totally different frequency to it. When we understand that our Inner Universe is connected to the All, and is unfolding the experience of our Outer Universe for better or worse, we know that we need to get better on the inside to do and experience better. Imagine if everyone did that. Imagine if everyone healed and remembered these inner DNA coded truths. I am adored because I exist. I matter because I am connected as One with all matter. I am immortal, eternal and infinite. I am already home and connected because nothing and nowhere else exists. And of course, ‘so within, so without’. Imagine if ENOUGH of us do this, despite what other specific individuals choose to do or not do. I believe we would turn this ship around and steer it clear of the rocks. I’m all for that, and I hope you are too. The first step is to sign up to my 16-day free course which includes a ton of free resources, as well as a workshop with me, where you will experience the subconscious reprogramming super-tool Quanta Freedom Healing – which fast-tracks healing from abuse more than anything else I know. Get free access to my 16 day recovery course here. I’m so looking forward to answering your comments and questions regarding this episode and exactly how one person at a time we can change ourselves to help change our world. And remember, after narcissistic abuse recovery, gloriously we take it further! http://family-court-corruption.com/wp-content/uploads/2019/01/tear-our-world-FB-YT-1.png 630 1200 admin http://family-court-corruption.com/wp-content/uploads/2018/06/800px_COLOURBOX7350498-300x151.jpg admin2019-01-27 00:00:472019-01-27 00:00:47Will Narcissism Tear Our World Apart? Live from Belmont Library MA – The Public Lie We’ve Been Told About Narcissism www.drcraigmalkin.com/the-book WHY RETHINK NARCISSISM? Is Narcissism Linked To Abuse Or Neglect? http://family-court-corruption.com/wp-content/uploads/2018/09/1536082255_maxresdefault.jpg 720 1280 admin http://family-court-corruption.com/wp-content/uploads/2018/06/800px_COLOURBOX7350498-300x151.jpg admin2018-09-04 17:30:502018-11-09 01:35:11Is Narcissism Linked To Abuse Or Neglect? Does Narcissism Appear In Neuro Imaging? http://family-court-corruption.com/wp-content/uploads/2018/09/1536074730_maxresdefault.jpg 720 1280 admin http://family-court-corruption.com/wp-content/uploads/2018/06/800px_COLOURBOX7350498-300x151.jpg admin2018-09-04 15:25:252018-11-09 01:25:54Does Narcissism Appear In Neuro Imaging?